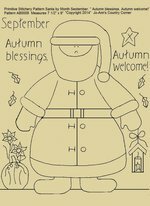 #B124 Primitive Stitchery Pattern Santa by Month September "Autumn blessings, Autumn welcome!" Measures approx. 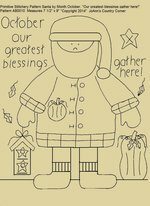 7 1/2" x 9"
#B125 Primitive Stitchery Pattern Santa by Month October, "Our greatest blessings gather here!" 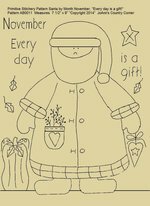 #B126 Primitive Stitchery Pattern Santa by Month November " Every day is a gift!" 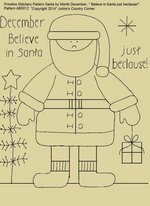 #B127 Primitive Stitchery Pattern Santa by Month December " Believe in Santa just beclause!"